Trying a new sport this year? Note: Be sure to refer to the owner's manual for your equipment before using WD-40® Brand products. SHARE E-TIPS WITH YOUR FRIENDS! 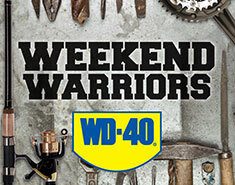 Check out the Weekend Warriors blog inside the WD-40 Fan Club. DISCLAIMER: MANY OF THE USES OF WD-40® MULTI-USE PRODUCT AND THE WD-40® SPECIALIST® PRODUCTS DESCRIBED ON THIS EMAIL WERE PROVIDED TO WD-40 COMPANY BY END-USERS OF THE PRODUCTS, AND DO NOT CONSTITUTE RECOMMENDATIONS OR SUGGESTIONS FOR USE BY WD-40 COMPANY. THESE USES HAVE NOT BEEN TESTED BY WD-40 COMPANY. CONSUMERS SHOULD EXERCISE COMMON SENSE WHENEVER USING WD-40 COMPANY PRODUCTS. ALWAYS FOLLOW THE INSTRUCTIONS AND TAKE HEED OF ANY WARNINGS PRINTED ON PACKAGING. "WD-40" IS A REGISTERED TRADEMARK. "MULTI-USE PRODUCT" IS THE PRODUCT CATEGORY. FOR SIMPLICITY IN THIS EMAIL, WD-40® MULTI-USE PRODUCT IS SOMETIMES SHORTENED TO WD-40®. This email is only sent to subscribers. Click here to unsubscribe or update your preferences.